Since we moved into this house more than seven months ago, my necklaces have been laid out across my dresser, haphazardly wrapped in a beach towel. It's the same way they traveled to this house, but they have no place to go since arriving! We had big plans to put little cup hooks on a few decorative shelves and put them on the wall by my dresser mirror. But it didn't happen. I'm scared of screwing it up, and then having not even a viable plan. Yeah, pitiful excuse. 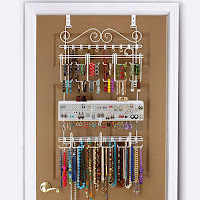 Something like this over-the-door beauty from Amazon would make all my jewelry more visible and likely to be worn. And isn't that what I've collected it all for, over the years?